wan life to live: "and in the morning, i'm making waffles!" 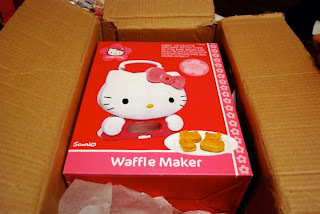 ever since that awesome hello kitty-fest a few months ago, i've wanted one of these. i remembered seeing and drooling over it at target ages ago, but had never actually picked one up. i ended up kicking myself over that, because of course, they were gone from the shelves everywhere i looked - in store and online. gah! so when i finally managed to find one on amazon, i jumped on it, using the last of the gift card i'd gotten from my boss for christmas. i can't wait to bust it out this weekend for a fantabulous waffle breakfast. luckily, the hub is pretty easy to please and is just happy to come home to find that i've already got dinner waiting for him. 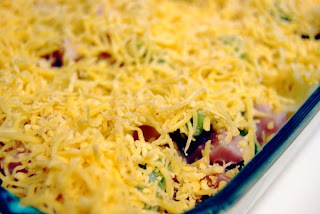 i know several folks who have to deal with picky fucks who can't stomach the idea of a casserole. heh. not me! 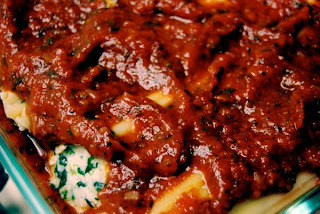 i'm not a big ricotta cheese fan. 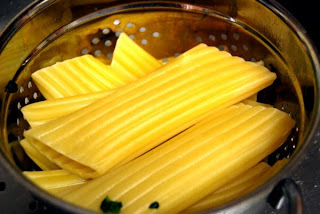 i don't know why - something about the texture of it doesn't appeal at all. the teen doesn't care much for it, either, but the hub digs it. 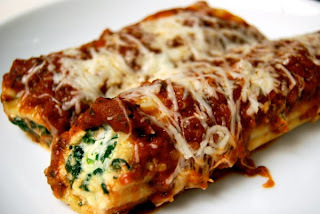 and so i decided to give it another shot with a recipe for spinach manicotti. couldn't hurt to try, right? 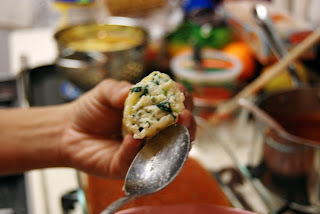 and stuffed the shells with the spinach mixture. 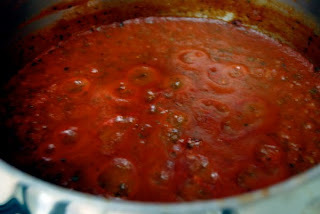 i put a few scoops of the sauce in the bottom of my glass pan and placed the filled shells inside, topping it with the rest of the sauce and some grated mozzarella. it looked good, right? and the hub, true to form, enjoyed it so much he had seconds. the teen and i, however, took a few bites and ended up picking at it. 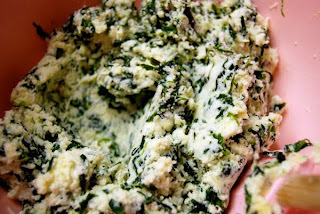 ricotta cheese FAIL. 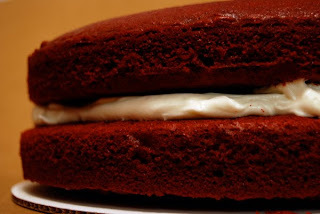 when the teen got home from her dad's this weekend, she mentioned that she'd really been craving some red velvet cake. and you know me - i'm always eager to please, especially if it means doing something fun in the kitchen. 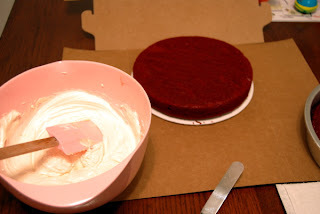 while i didn't feel up to making it from scratch since i had a perfectly good red velvet cake mix in the pantry, i did stop in to my cake supply store to pick up a cake board and box. my cake holder is, like everything else, in storage, and so i figured i could at least spend a buck and pick up a disposable container. 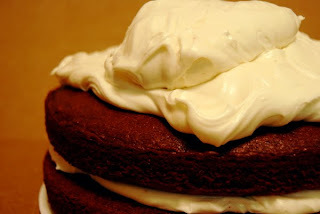 i used the vanilla cream cheese frosting recipe i had bookmarked and got to work on the final step of the teen's special treat. the cake had turned out so perfectly, so...moist (bleh, i hate that word), that as i spread the filling onto the bottom layer, i ended up mixing crumbs into it. 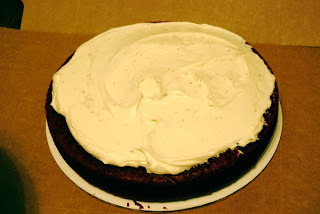 the top layer came out of the pan just as easily (thanks to a lining of parchment paper and a quick spray of pam), and i plopped it on top of the filling and started frosting the top and sides. 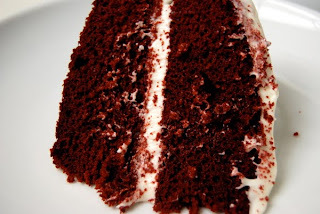 the teen drooled as i sliced into the finished cake and presented her with a good-sized wedge. 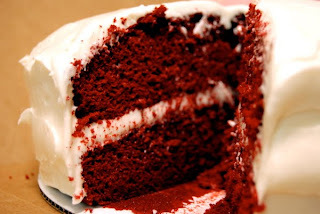 red velvet cake is just so pretty. i dig it. and, well, of course, it tastes pretty damn good, too. the cake box makes it look pretty pro, huh? well, at least i think so. ha! 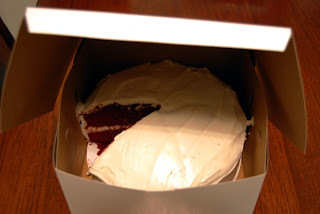 after i sliced some for me and the hub, we were still left with 3/4 of cake in the box. we've got cake for days, folks. i wish some of you lived closer so i could share it. *sigh* so much for that fitness/weight loss goal. also, that waffle maker..too stinkin' cute!! I live in Redlands... i can haz cake??! 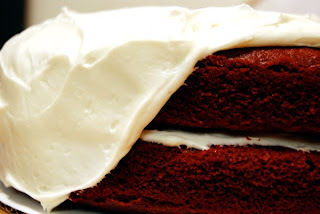 Red velvet cake for days is a problem I wan-na have. Yeah, I'm thrilled to have a husband that will pretty much eat whatever I put in front of him. Makes meal planning really easy. 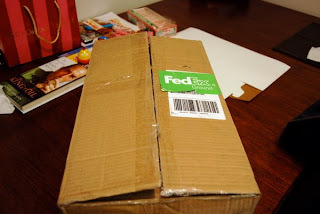 I'd eat day-old fedex'd cake anytime. CAKE! Yum. I wish I could just stop by and grab a slice. 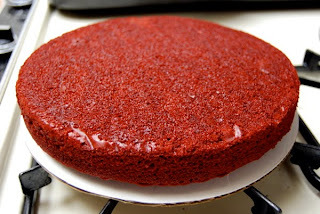 I am going to attempt to make Red Velvet cake from my DH's birthday this weekend. Wish me luck! Yours looked delicious!